When you think of bees, what do you imagine? Fierce stings? Gallons of honey dripping from a hive in a tree? The famous “waggle” dance that bees use to communicate? It may be time to update your knowledge of these incredible insects. With over 20,000 known bee species in the world, a large percentage of bees might not fit into your traditional views. 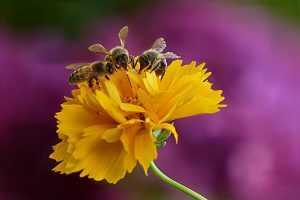 Below, you’ll find some of the most commonly believed bee myths debunked, as well as some little-known facts about bees. Some statistics estimates that the US houses more than 2.64 million beehives, which produce an average of 149 million pounds of honey in a year. That’s a lot of honey! But this production comes from honey bee and stingless bee species. Only about 10 species of honey bee and less than 450 species of stingless honey bee produce enough honey for us to use their stock. The average bumble bee (including approximately 260 species) may produce a teaspoon or two of honey, which the bee needs to survive. That still leaves thousands upon thousands of bee species that never give us a drop. If you’ve ever watched bees in your backyard, then you may have noticed pollen collecting on the bees’ legs. Since they take this pollen home with them, you might think that they use the pollen to make their honey. Although bees do eat the pollen, they don’t use it to make honey. Rather, when they land on a flower, they collect its nectar, a sugar-rich liquid that they store in their stomachs. The nectar mixes with enzymes in the bee’s abdomen, and then they regurgitate the nectar at the hive. Worker bees then fan the liquid until it becomes the thick, syrupy honey you know and love. The sticky pollen that clings to them gets passed from flower to flower to make the bee a pollinating powerhouse! Many cartoons and movies portray bees as living in thick honeycomb hives dripping with golden honey. But as with the honey myth, this imagery applies only to select species of bees with advanced social communities. In contrast, a large percentage of bee species consist of solitary individuals. Many bees nest in burrows in the ground, while some take over abandoned beetle burrows in wood. Mason bees, for example, favor hollow plant stems and even empty snail shells when making their nests. Gardeners who wish to create a friendly environment for these pollinating insects often place bundles of hollow canes or logs drilled with holes throughout their yard. If you’ve ever been stung, you may have taken a small amount of satisfaction in knowing that the bee will never be able to repeat the offense. But unfortunately, this depends on the type of bee that stings you. When honey bees sting, their barbed stinger becomes embedded in your skin. When they try to pull away and sting you again, the barb detaches and pulls some of its digestive tract along with it. As a result, they die not long afterward. However, other bee species have smoother stingers. Bumblebees and solitary bee species, such as the lasioglossum and the halictus, can safely remove their stinger from your skin and then proceed to sting you multiple times if provoked. Additionally, some bee species have stingers so small that they simply cannot pierce your skin, let alone become embedded in it. Both you and the bee can come away from the fight unharmed. A lot of bee species are diurnal, so they tend to go home to their nests at night. Cooler evening (and early morning) temperatures also make bees more docile, so they’re less likely to fly after you in the dark. As a result, some people assume bees never sting during the evening. However, queen bees can certainly sting in the dark. In fact, established queens often seek out virgin queens and eliminate them. And if two virgin queens emerge at the same time, they’ll fight each other to the death. All of this takes place in the dark recesses of the hive – no bioluminescence needed. Honey bees do communicate to other bees in their colony via a “waggle” dance. This dance consists of 1 to 100 (or more) circuits, which involve running through a small figure-eight pattern. But this dance isn’t always enough to get the message across. Some speculate that the dance only attracts the attention of other workers, just so the bee can share an odor trail to the food source. Bumblebees, in contrast, communicate to other worker bees by passing pollen. And still other bee species prefer to forgo the communication entirely and keep the good food sources for themselves. Do you have other questions about bees or bee removal at your home? Call ASAP Bee Removal at 602-751-1002-bees are our favorite topic of discussion! If you want to keep up on the latest buzz about bees, check our blog frequently for updates, facts, and tips.